From the moment you walk into the Westside Theatre, you’re immersed in the quirky world of Josh’s New York City apartment… as it is getting robbed. Thus begins this hilarious rock-and-roll romantic comedy about good guy Josh caught in a lifelong battle with bad luck. But just when all hope seems lost, a mysterious letter arrives that changes his life forever. A cast of mind-blowing actor-musicians leap in and out of the story playing almost as many parts as they do instruments. “It’s Seinfeld meets Rodgers & Hart,” raves one in an endless string of love letter reviews. 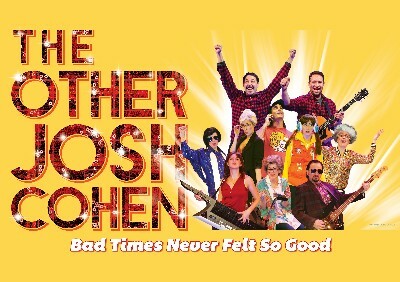 This funny, touching, hummable new musical makes its triumphant return, hailed by Jesse Green of The New York Times as “the spontaneously charming musical that is just right for right now.” The Other Josh Cohen is a 90-minute life-changing laughfest for the whole family that will leave you feeling better about the world. 3. IN PERSON: Print & bring offer to the Westside Theatre Box Office 407 West 43rd St [between 9th & 10th Aves) between noon & 6pm on performance days. Offer valid for performances thru 2/24/19. Blackout dates may apply. Not all seats are discounted. Prices include a $1.50 facility fee. All sales are final — no refunds or exchanges. Offer subject to availability and prior sale. Not valid in combination with any other offers or for previously purchased tickets. Normal service charges apply to phone and internet orders. Cast and Performance schedule subject to change. Offer may be revoked or modified at any time without notice. Limit 10 tickets per order.